Peter Gabriel’s second album, nicknamed Scratch, is probably the most debated and perhaps the least loved album in his whole discography. It has no hits like Solsbury Hill or Biko but a mood that swings mainly between torn and depressed. The artwork mirrors this cold and inhospitable atmosphere. This obscure masterpiece is nevertheless worth a closer look and listen! It is 1978, and it has been four years since Peter Gabriel has left Genesis. His former band mates are trying their hand at catchy pop music (Follow You Follow Me) while Gabriel faces the difficult challenge of producing his second solo album. His self-titled first release showed him on a search, a quest for musical identity and artistic directions. Despite the variety of styles and the lack of coherence the debut album had been very well-received by the critics. Solsbury Hill even turned out to be an unwreckable world-wide hit. Now the second album had to point the direction in which he wanted to go as an artist. 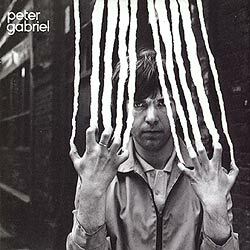 In preserving his inner rift Peter Gabriel manages to produce an album with a consistent mood. The sound is very special, even unique. This is partly due to Robert Fripp who produced the album. The sound is flat, rough, almost tortured, the vocals are often distorted. Critics complained that the sound were weak and lacked oomph, but this was intentional as the album oscillates between depression, helplessness and cynicism. The inner tension reaches a maximum in Exposure, a piece strongly influenced by Fripp. Its repetitive guitar riff (enhanced by Frippertronics) expresses a truly corrosive and seemingly unbearable desperation. There are some spots on the album where a brighter light shines through the gloom. Mother Of Violence, for example, is a wonderful fragile ballad, and there are also a number of groovy up-tempo pieces like On The Air, D.I.Y., Animal Magic and Perspective. Hipgnosis have carefully designed a cover that fits the music perfectly. The front shows Peter Gabriel who seems to scratch a photo of himself with his fingernails; thus the album nickname Scratch. The back shows a dreary winter city scene: Someone is walking under a bridge, freezing and longing for warmth, but their surroundings are cold, lonely and dark. These two poles – aggression and tornness on the one hand and helplessness, loss and loneliness on the other hand – show up in many songs. Listeners were as divided as the album itself. Few Gabriel fans would call this their favourite album. It is perhaps not quite wrong to say that Gabriel overcomes his inner division only after this album and turns the solution into perfect pop music on III, IV and So. The album at hand may not be a perfect Gabriel-style album, but its experimental and conceptual character brings it closer to Genesis (and particularly The Lamb Lies Down On Broadway) than any other of his albums. Artist and fans have made their peace with the second album, at least on the Warm Up summer tour 2007 when Gabriel played a number of songs from the album to enthusiastic appreciation. Again Peter Gabriel managed to assemble an excellent band for his second studio album. Tony Levin was there, of course, and so were Larry Fast and Jerry Marotta. The album was recorded between November 1977 and February 1978 in the Netherlands and in New York. The album begins with a lively rock piece. A pulsating no-nonsense number it profits most of the excellent work of Tony Levin on bass and Chapman stick. Gabriel’s vocals seem rough and tortured. The lyrics mention the peculiar Mozo character again; it seems there is/was a bigger concept behind it. On The Air tells how Mozo breaks out his short wave radio every night to make a name of himself. D.I.Y. is the next song with a pumping bass sound. Despite that it is a light song compared to all the heavy-duty music that makes up the rest of the album. In concerts D.I.Y. would usually get the crowd going. It is a song about taking things into your own hand and not being a dummy who fulfills the expectations other have of them. It has also been read as a sexual innuendo. D.I.Y. was released as a single but did not succeed in the charts.. Mother Of Violence begins with the sound of insects on a warm summer evening. The song itself is based on acoustic guitar and classical piano. Peter Gabriel sings with a fragile voice about fear as the mother of all violence. The music of this touching ballad links very closely to the lyrics which makes the song one of the outstanding pieces in Gabriel's oeuvre. On the Warm Up summer tour 2007 the song would be sung by Peter's daughter Melanie. A biting satire on the Western supermarket society. A Wonderful Day In A One-Way World mixes reggae and funk with a couple of weird keyboard sounds. The sarcastic tone provides a lighter note on the album. White Shadow is another highlight. It begins with a long instrumental prelude; the foundation is provided by Tony Levin's excellent bass. Muffled drums and keyboard chors give the impression of resignation and hopelessness. Near the end there is a guitar solo, a rare thing in Peter Gabriel's music. The lyrics are rather cryptic and leave lots of room for different interpretations of the white shadow. Meet pure melancholy in Indigo with a heart-rending beginning. Accompanied only by the piano, Gabriel sings about letting go, about leaving life, about death. All the frustration culminates in this one most moving line „Alright, I'm giving up the fight“. The music supports the mood by its extreme slowness and elegiac flair. Another emotional highlight. Two emotional highlights of White Shadow and Indigo are followed by a merrier song. Animal Magic is a short break on the cold and gloomy way Peter Gabriel is walking on this album. A bar piano and lively guitar create a sound that presages the pop side Peter Gabriel would bring to perfection in songs like Sledgehammer and Steam. It deals with the animal behaviour people show when they go to war. This song marks the peak of depression on this album. It is based on a manic repetitive motive over which a distorted voice keeps repeating the word „exposure“. Note the remarkable bass line and the guitar effect Robert Fripp employs (the so-called Frippertronics). An alternative and even weirder version of Exposure can be heard on Robert Fripp's album of the same title. Another piano-based song with strangely delayed vocals. Coming in at slightly over two minutes it is a short song that resembles a fragment rather than a full-size song. Peter Gabriel describes an inner emptiness in a lethargic mood. But as there are always flotsam and jetsam in the sea there is always hope in the ocean of life, a hope he wants to hold on to. Perspective is another rock song – a fat guitar riff, recurring chords on the piano, a hot saxophone and soulful vocals. Perspective is certainly the most optimistic song of the whole album. The lyrics describe how we as children of the Earth („Gaia“) should employ different perspectives to note different areas of life and nature. Home Sweet Home is the ghastly finale to a gloomy album. It tells the story of a couple who spend all their money on a flat in a high-rise. Their Home Sweet Home turns out a rather inhospitable sort of prison. One day the protagonist returns from work to find out that his wife committed suicide and took their child with her. He takes the insurance money to the casino to lose it all, but instead he wins and can afford a house in the country. He has finally found his Home Sweet Home. Peter Gabriel sings this horror story with lots of drama in his voice accompanied by piano and plaintive saxophone. A worthy finale to a great album! Peter Gabriel created a mixture of the World Music in Passion with the Mainstream of So. "This Is Party Man" gets single release! Peter Gabriel will not perform at Venezuela Aid Live!